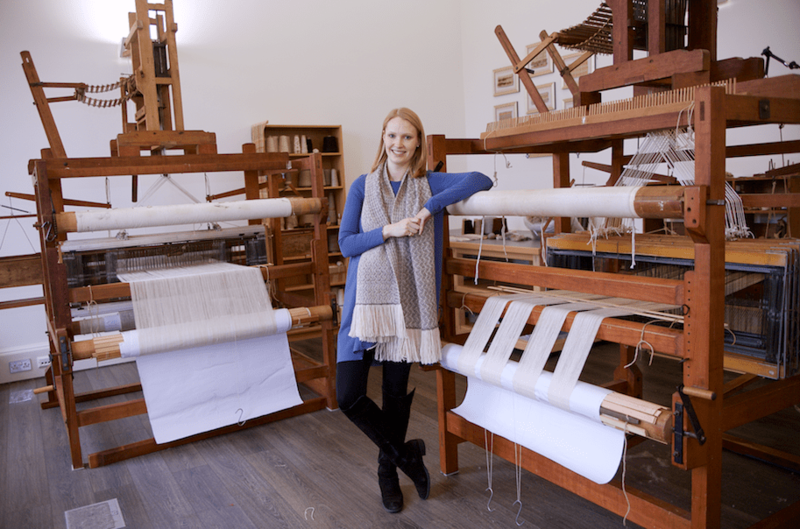 In these days of repro products and cheap disposable fashion imports there is something refreshingly authentic about Araminta Birse-Stewart’s hand-weaving workshop and showroom down on Leith waterfront. The clatter of the loom, which sounds similar to someone shovelling coal, is a constant reminder that aside from being a studio to showcase her range of unique accessories and interiors, this is a production centre. The business, known by her maiden name of Araminta Campbell, operates from the former headquarters of Forth Ports and her showroom window looks out on the Fingal, a former lighthouse ship which has undergone a £5m conversion into a luxury hotel and events venue. Araminta Campbell has supplied some of the ship’s bed dressings. It is one of a number of corporate customers Birse-Stewart is now targeting on a purely bespoke basis. She has designed a tweed for a Norfolk estate, an Araminta Campbell suite at the Waldorf Caledonian Hotel, and kitted out the new Fife Arms Hotel in Braemar with everything from curtains to staff uniforms. “We’re certainly not aiming for mass production, though that’s not to say we are not scaleable,” she says, one of the few times she slips into management speak. Despite her rapid early success – turnover will rise more than fourfold this year – she shies from figures and the mechanics of building what is an emerging new brand. Her fabrics are sourced locally and her designs are influenced by nature, particularly the Aberdeenshire environment where she grew up. She says she remains at heart a country girl who likes nothing more than taking her dogs Piccolo and Pocket, two of eight in the family, for long walks in the great outdoors. Known to her friends as Minta, her name was taken from a distant relative on the Western Isles who was also a weaver and offered her a loom which was in pieces. It was one of a series of serendipitous meetings, including others with loom owners who led her to acquire the two veteran machines now plying their trade in her workshop. The opportunity to get hold of quality equipment, firstly to fulfil a commission at a textiles event in Poland, helped the young graduate start up and get herself established soon after leaving Manchester Metropolitan University, though perhaps the most important decision she made was to learn the rudiments of weaving in the final weeks of her embroidery degree. 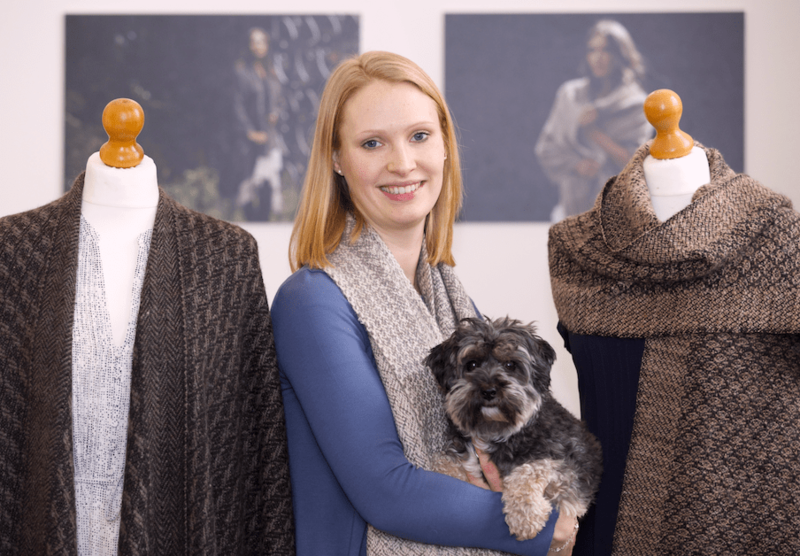 After a short-lived contract job in catering and an internship with Johnstons of Elgin she was offered some alpaca fibre from a Borders mill to make some products for Christmas and she began thinking of turning her passion for cloth and creativity into a business venture. Still in her early twenties she moved to Edinburgh to be closer to suppliers and took small premises in Meadowbank, before moving to the Biscuit Factory, also in Leith, which was not without its challenges. “The roof leaked, we had luxury products getting damp. It’s a fantastic space, but it didn’t work for us,” she says, adding that her business often received tourists brought in to see her luxury range. The move to Leith waterfront has, she says, transformed the business. With the help of Joy Lewis’s Adopt an Intern she has hired Kelsey Johnston as business development manager and used the service to hire other staff. “It’s a great service and I will be using them again,” she says, adding that Kelsey had experience of working in industry. Her father, the oil and gas entrepreneur and former CBI Scotland chairman Melfort Campbell, helped with mentoring, and the business received support from the Bonnington Business Fund, Scottish Enterprise and £37,500 from the Scottish Edge scheme. She had also been putting money aside from a young age and was able to draw on this personal pot to supplement these other sources of finance. Now she plans the next stage of development, though she is keeping a lid on expansion. “I am taking on a production manager and someone to do the book-keeping. We’re growing and I want to be a high end brand but I want to remain small and exclusive. What sort of a boss are you? I don’t see myself that way. My staff work with me, not for me. I don’t really follow celebrities and I’m not really interested in fashion itself, but I do like Stella McCartney’s classic style. I never switch off. I’m always looking at patterns in nature. Any breakdown in communications, and people who do not show respect. My family home in Aberdeenshire and the Isle of Mull where I went when I was young and where my husband to be proposed to me. If you could invite three people, past or present, to a dinner or meeting, who would you choose?